The most efficient trainee is an ordinary person who uses laser precision in their exercise selection, progression and workout protocols. Bruce Lee taught us to be wary of dogma. That’s the first step in opening the mind enough to search out and use the best tool and the best approach for a specific job. But once the tool is decided upon, you also need to focus on rock solid technique. That’s another Bruce-ism that underscores the point. Grooving perfect technique in a given exercise is going to set you up for the NEXT exercise in the progression. In order to truly understand that, you have to realize that we aren’t JUST training muscles (or burning fat) when we exercise… We’re training the NERVOUS SYSTEM. And that’s serious business. 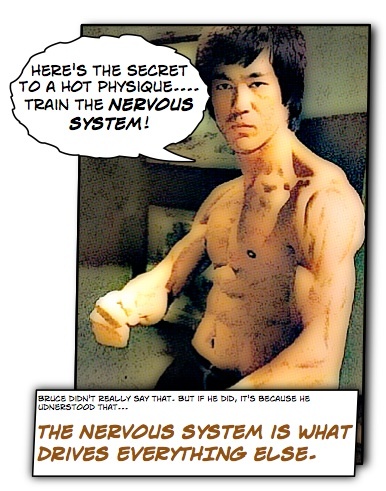 Your nervous system is what drives EVERYTHING else. When it’s firing properly, it opens floodgates in the body that allow you to train in a way that slaps on muscle and rips off fat. But if you mistreat your nervous system, it’ll throw on the parking brake and your progress will come to a grinding halt. That’s why we take quality of coaching so seriously. You need PRECISE instruction and coaching cues if you want to get full benefit from your training. We’re very careful to provide that type of quality coaching when we introduce you to a new exercise or training method. Unfortunately, that seems to be the exception rather than the rule for a lot of coaches online. But there are a handful of people that we trust wholeheartedly to provide instruction on this site. And one of them is our colleague Dr Kareem Samhouri. He’s not only a true master of human movement, he’s also a fantastic teacher. And that’s a powerful combo. Dr K is also maestro of many tools. We’ve both been members in Kareem’s Double Edge Fat Loss mega-site for the past few months and the variety of tools, methods and exercises he provides is mind boggling. And I’m sure you can see the relationship of that exercise to the Side Plank Thrust we looked at last time. Once you’ve built up your ability to stabilize on one dumbbell and lift the other towards the sky — using perfect form — you’ll have developed the kind of core stability that’ll allow you to easily blast out reps of the Side Plank Thrust. But hopefully you also saw how we snuck in under the radar — training the nervous system every step of the way to be ready for the next progression. That means that everything stays firing at 100% and that we’re able to draw maximum fat burning and muscle building potential out of our workouts. Get rid of the faulty movement patterns. Banish your body’s imbalances. Build your foundation properly using whatever tools are best for the job and you’ll unlock your full potential. Stay tuned… we’ll be back in a few more days with more information about the importance of the nervous system in your training and how you can fuse bodyweight workouts with dumbbells for some serious body transformation results. Great tutorial from Bruce and Dr. K! .-= John Sifferman´s last blog -> Don’t Buy Russian Kettlebells Until After You’ve Seen This =-. Hey John – Thanks for droppin’ by bro! I’ve gotta see how some of my favorite coaches are doing from time-to-time! Keep it up guys. actually trained with one of his close friends for about 6 months… pretty crazy! As Adam wrote above, we’ve both been members of Dr K’s Double Edged Fat Loss site for the past couple months. I’ve spent that time working with his materials and I’ve gotta tell ya I’m having a blast. It’s great stuff, it’s comprehensive and well explained, and I’ve seen superb results with his workouts. They’re also fun and very very challenging – each time I finish one I step outside and wring out my t-shirt. Dr K is a respected colleague and a good friend. We’d love to share more of his work with you as BodyweightCoach continues to grow. love having you on board, and you’ve cultivated a phenomenal bodyweight culture over here. You all are very intelligent, motivated, and eager to learn. Thanks for allowing me this opportunity to share my passion with you. That is a great exercise. We were doing them in circuit training, but they seemed to disappear. That’s a good point, Harry. Let us know how it goes…. Hey Harry – yeah, that’s a great example of the functional carry over you enjoy when you focus on training not just the muscles but specifically developing the nervous system. >But a punch generates power, not so much from the arms pushing, but from the hips moving and shoulders twisting. I really appreciate the progression beginning with the variation on the knees. Hey Greg – Definitely. That’s one of the things we love about Dr K. Like us, he takes the time to thoroughly cover all the bases in his coaching. 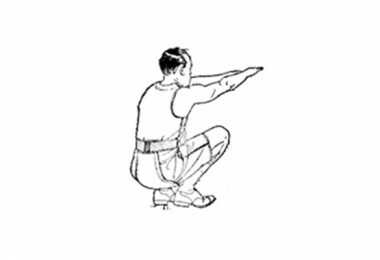 I have a question about this exercise. I try to be careful about lower back twisting movements because every now and then I seem to “throw my back out.” Not sure why this happens — sometimes just bending over to pick up a piece of paper off the floor can do it! (I’ve had an MRI and nothing is out of place, no bulging disks, etc.) My question: Is this stressful on the lower back? Is there anything I should be aware of when doing the exercise so that I don’t hurt my lower back? Thanks! Sounds like you might have a hypermobility in your back… a segment of your spine that wants to move too much and others that don’t move enough…. this results is what’s called a ‘stuck facet’ and is negative on MRI’s, etc. but it’s real pain. Thanks Dr. K! I look into this further. I’m determined to get back to my athletic lifestyle, but I’m trying to build up slowly. Appreciate your response. HI GUYS, AS I HAVE SHARED I JUST HAD BI-LATERAL TOTAL KNEE REPLACEMENT. DURING THE DOWNTIME BEFORE AND AFTER I HAVE ATROPHIED DRAMATICALLY. I HAVE BEEN TOLD BY OTHER TRAINERS NOT TO DO PUSH UPS ETC (BODYWEIGHT WORK) AS MY BODY ISN’T STRONG ENOUGH NOT TO HURT A SHOULDER OR SOME OTHER MUSCLE. HOWEVER I LOVE THE STUFF YOU GUYS ARE DOING AND WOULD LIKE SOME GUIDELINES AS TO HOW I CAN FOLLOW YOUR PROTOCOL AS OPPOSED TO GOING INTO THE GYM AND STARTING A DUMBELL REGIME. I politely disagree… but I can’t see you. I’d suggest you just find the right level of ‘push up’ so that you can exercise safely. This applies to all exercises. The comment started out talking about a BKA, but it ended talking about an upper body exercise. I think this is a common point of confusion… it’s essential to exercise everything else in your body as much as possible while injured (just not the injury without medical guidance) – it speeds up healing significantly. Very interesting John and I have been around the fitness industry for 30 + years and I must say I haven’t seen this excersise T -pushup with DB, I will be trying this one out and using it in some of my fitness classes, Once I can master it myself ! I run a non profit boxing club fitness center here in a very small town in NS. Canada and this is the first time I have heard of you, But I will be listening and learning, This is one thing I have learned John there is always something new to learn no matter what the age. Thanks for the comment – I’m really glad to have taught you something new and I hope it makes a small positive dent in your clients’ lives. You might notice that we’ve switched on comment moderation. We hate doing that because you have to wait for your post to show up. We welcome civil discussion, and we believe that disagreement and the exploration of different points of view can be productive and can lead to new insights. We won’t, however, tolerate trolls directing personal slights at our commentors or colleagues. This blog is our online home, a place where we hope each of you feels welcome, and we’ll do our best to keep it that way. Its very urgent. I am looking at your videos from quite a some time. I love the way you teach. I have literally gone crazy to be your protege. I wanna buy DEFL which is on sale now. Actually, I am from India. I wanna know if by purchasing your program is there is something that is goin to be delievered coz i believe you’ll not be able to deliver it to India. If its all online stuff, can I use my AMEX card to go for the purchase? Waiting for your reply before 10th Sep 10 . For sure, a superb coach. For now on I’m a Dr. K fan. But I don’t now if I get it right: the idea of the twist is to twist the spine, while fixed foots on the floor or to twist both foots toghether, one above the other and go to a side unstable plank? By the video I suppose that is to twist the spine, but all the other pushups of this kind that I find on the web the twist the foot, and in the end one is above the other. Well, I really trust K, so for now on I’ll do the way he does it.